Great value starter kit gift pack of 4 products to nurture and care for dry & dehydrated skin. 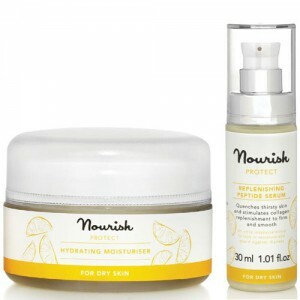 Everything you need to get started with the Nourish Protect range for dry & dehydrated skin, in substantial trial sizes that contain plenty for a holiday or to give the range a thorough try before you commit to the full sizes. 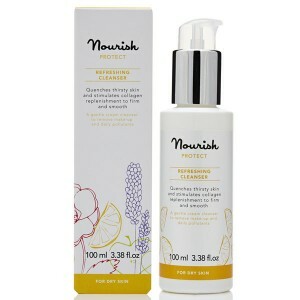 A gentle cream cleanser to remove makeup and daily pollutants. This peptide serum quenches thirsty skin and stimulates collagen replenishment to firm and smooth, protecting skin and leaving it visibly healthy and hydrated. Phytoactive soya and rosehip seed oils, rich in essential fatty acids, are combined with antioxidant vitamin C from organic mandarin oils, orange oils and fresh Sicilian lemons to restore moisture balance and optimise skin health to ensure skin nutrition and protect collagen. 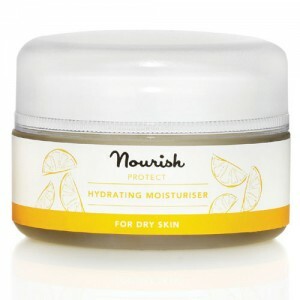 High-tech natural and organic formulations that deliver real results, Nourish Skincare provides a modern skincare support system to keep skin in optimum health. Try it with a starter collection and you’ll be hooked. Aqua (water), Citrus limonum (lemon) fruit powder*, Helianthus annuus (sunflower) seed oil*, Glycerin, Sodium levulinate, Levulinic acid, Cetearyl glucoside, Glyceryl stearate, Citrus sinensis (orange) peel oil expressed*, Cetearyl alcohol, Coco glucoside, Citrus nobilis (mandarin) peel oil expressed*, Potassium sorbate, Xanthan gum, Citral, Limonene, Linalool. *Certified organic. Naturally present in essential oils. Aqua (water) , Citrus limonum (lemon) fruit powder*, Citrus sinensis (orange) peel oil expressed*, Citrus nobilis (mandarin) peel oil expressed*, Levulinic acid, Glycerin, Potassium sorbate, Coco glucoside, Citral, Limonene, Linalool. *Certified organic. Naturally present in essential oils. Aqua (water), Citrus limonum (lemon) fruit powder*, Glycerin, Palmitoyl tripeptide-5, Coco glucoside, Sodium hyaluronate, Sodium ascorbyl phosphate, Xanthan gum, Sodium levulinate, Levulinic acid, Citrus sinensis (orange) peel oil expressed*, Citrus nobilis (mandarin) peel oil expressed*, Potassium sorbate, Sodium hyaluronate , Citral, Limonene, Linalool. *Certified organic. Naturally present in essential oils. Aqua (water), Aloe barbadensis leaf juice powder*, Citrus limonum fruit powder*, Glycerin**, Cetearyl alcohol, Helianthus annuus seed oil*, Glycine soja oil*, Cetearyl glucoside, Sodium levulinate, Levulinic acid, Rosa canina seed oil*, Cetearyl olivate, Sorbitan olivate, Glyceryl stearate, Citrus sinensis peel oil expressed*, Citrus nobilis peel oil expressed*, Xanthan gum, Potassium sorbate, Sodium ascorbyl phosphate, Citral, Limonene, Linalool. *Certified organic. **Organic origin. Naturally present in essential oils.